In this issue Robin escapes from Bane and Killer Croc, who fight each other right into the Gotham harbor. Robin returns to the Batcave to fill Batman on what went down in Gotham's sewers. While Batman needs rest he can't help but suit up and go looking for some of the bad guys who went missing when Arkham was destroyed a few issues ago. Cornelius Stirk is a villain who can use pychic powers to look like anyone and instill fear into a person. After killing a man, Stirk is found out by The Joker who wants the two to team up. Joker's plan is to take Commissioner Gordon hostage and create total chaos in Gotham. Batman uses the Batcompter to look for places where Stirk might be and follows some clues to a crappy area of Gotham called the hub. He finds Stirks hideout but is too late to save another of Stirks victims. Batman discovers a diary that has Stirks and Jokers plan to kidnap Gordon. The bat signal goes up and Gordon goes out to answer it. Gordon reaches the Bat signal and Batman comes out of the shadows to greet him. But it's not the real Batman. It's Stirk using his powers to appear as Batman to Gordon and stab his heart out. The real Batman shows up and makes the save. Joker watching from afar thinks that Stirk was a total idiot but wanted a laugh anyway. Scarecrow shows up after being told by Joker's gang that Joker had something major planned. Scarecrow hates the fact that Joker went to Stirk when Scarecrow calls himself the true master of fear. 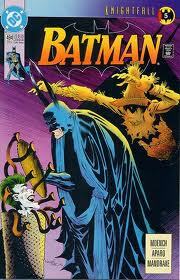 Scarecrow and Joker agree to team up and they take Mayor Armen Krol hostage with Scarecrows fear toxin. Gordon has had a total breakdown from the assault by Stirk and can't get a grip on realty. Gordon's wife Sarah tells Batman that all this craziness is his fault. Batman thinks to himself that if he can barely put away Stirk what will happen when Bane comes for him.